Greendale Community College is kind of an absurd place. But the beauty is that, within the absurdity, there's something tangible -- there are lessons that are integral to life outside the four walls of the school. There are people there who will forever change the lives of one another, for better or for worse. And in a place that's so full of wacky shenanigans, paintball wars, space buses, and legal trials over a Biology project, there's still this question lingering: what IS crazy? Is craziness defined by how many dances your school holds? Or how often the dean bursts into your study room wearing a ridiculous outfit? Because, if so, Greendale is the most insane place on Earth. But what if... what if that's not what it means to be crazy? What if Greendale is actually sane? (This might be a stretch for some of you to agree to, so let's backpedal and ask this question instead: what if there were a place where students needed to go to in order to learn about themselves and others, while under the guise of NOT learning?) Sometimes it's easy to forget that, for all of these characters, Greendale has changed them. Not because it's anything special, necessarily. It doesn't have magical powers. It's simply WHAT they need. It's where they need to be. It's where they belong. This episode opens with the narration: "Greendale Community College is represented by two separate but equally important types of people: the goofballs that run around stirring up trouble and the eggheads that make a big deal out of it." I love this opening for reasons that are two-fold. First, it is - of course - an homage to the opening of Law & Order (which I will discuss momentarily). But also, this is a clear representation of Greendale as a whole and the people within it. Even within a study group, we get the distinction between the two types of people mentioned. And I think that for a lot of students who attend the school, Greendale is a place they need to be because the world outside is scary. And somehow, going through blanket fort wars and stolen pens makes life bearable because it gives them a break from thinking about things that weigh on their minds all day, every day. It's a place that does, however, teach lessons. We're about to learn how Greendale has changed Jeff as a character, and how Professor Kane has changed Greendale. Now, I'll be completely honest with you -- I was never a Law & Order girl. I think that I have watched every other crime show on television except for the one that truly started it all (it's a shameful fact that I need to remedy, especially after watching this episode). However, the fact that I have not really watched the show doesn't mean that I appreciated or enjoyed this episode any less. Sometimes parodies or homages seem heavier than they are. And what I mean is that they can very easily weigh down the plot of an episode -- if you focus too hard on creating an homage, you may lose the importance of the plot. And thus, the homage itself could be completely flawless, but at the sacrifice of good writing or cohesiveness. I am very proud to say that this is, hands down, my favorite homage episode to date on the show (or any other show). Megan Ganz - the fabulous writer of the episode - worked the homage around the plot, not vice versa. (Or at least, that's how it felt.) If you loved the episode and are on Twitter, go and write her some nice things: @meganganz. As such, this blog-review is basically a love letter to her for writing a hilarious and flawless episode. So, you're probably waiting for me to recap the plot of the episode. And since I always aim to please, here goes: this episode centers around Biology class (remember that the study group actually does go to class... at some point) and their final project -- growing a yam. It opens with two janitors (hello, janitor-who-tried-to-recruit-Troy-and-whose-name-I-don't-know!) discovering a smashed project on the floor. As it turns out, it's the study group's yam. Around midnight, Jeff and Professor Kane are alerted by Annie to come to the study room, and the rest of the group shortly follows. The entire episode becomes a Law & Order-style homage to try and discover who ruined their science project. I quite enjoyed the return of Professor Kane, and his presence throughout the episode. Here's why -- when we first meet the professor in "Biology 101," he's from the 'outside' world. He's the first character who means something to the group and has an impact on them but has not been within the walls of Greendale for years on end. He brings a new perspective on life and makes the study group think about (and suffer for) their actions. Jeff, never one to be taught a lesson willingly, instantly believes that Professor Kane has it out for him. And I've said this numerous times, but the study group - our study group - thinks of themselves as the wheel and spokes that Greendale turns on. This isn't true, and Professor Kane is meant to bring them back to reality in his first appearance of the season. And he manages to do so quite well. This episode is intriguing though because we get to examine him more as a character -- as someone who genuinely cares about the study group now, but who is also just and fair. A lot of the characters we have seen throughout the seasons seemingly care about the study group, but often not enough to help them grow and become better people. I don't think a professor has actually TAUGHT them anything substantial about life... until now. Shirley gets a chance to shine in this episode, as she immediately takes on the role of the "chief" in the crime-show homage. She explains that she's watched a lot of television and knows how to handle herself in this situation, so she appoints Troy and Abed as her detectives. And I love that Shirley gets this role (it's a nice reversal from "The Science of Illusion" where she was basically a rookie cop with Annie). For Annie and Shirley, however, the characters that they channel throughout the episode are very telling in regards to each woman's personality. Shirley has always been a character that others fail to take seriously. And it's not for the same reason that people fail to take Troy seriously. She's not as young as Annie or Britta, but people often forget that she can command and demand just as much respect and attention as anyone else in the group. So there's this part of her that she channels for the role (as well as the cop she played in "The Science of Illusion"), where she places herself in a position of authority and exudes confidence in giving orders. And Troy and Abed (whether because they are "in character" too or just being themselves) respect her and follow her instructions. Shirley is a strong, independent female character and I think that sometimes she loses that about herself and needs to be reminded. Annie is different because (as Abed notes in "Remedial Chaos Theory") Annie will always be driven. She's a person who, ironically, is just as manipulative and selfish sometimes as Jeff is, except that she is able to mask it behind Disney eyes and cardigans. But when Jeff notices, later in the episode, that she cares more about winning than she does about respecting the people around her, he steps in. Because sometimes Annie lets her ambitions drive her to do things that are against her character. And she needs Jeff -- remember "Investigative Journalism"? Or "Intro to Political Science"? -- to remind her when she's stepped into dangerous territories. 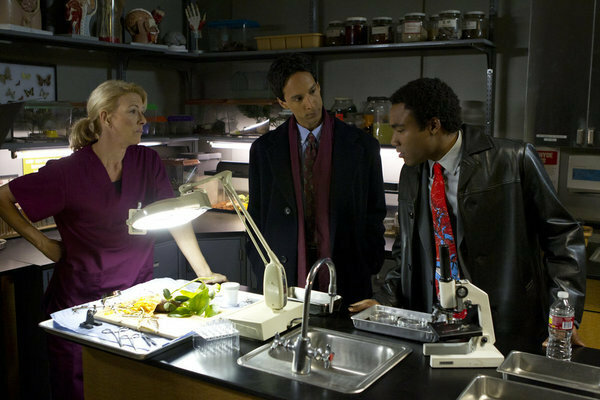 Troy and Abed, as detectives, scour the campus to question potential suspects. They begin with Pierce, who quickly points them to Todd. And this episode marks the return of our favorite scapegoat. It's easy for the study group to blame all of their problems on an outsider - someone with whom they have no connection. And I have a theory, so bear with me, that up until "Cooperative Calligraphy" (oh look! Another Megan Ganz episode! ), the group might have been apt to pinpoint each other as culprits (not just in this yam scenario, mind you). But when Jeff makes the comment to Abed about not being able to trust anyone within the group again if they step outside of the study room without finding Annie's pen, it seems to be a hinge -- from that moment forth, they begin to function as a "group" rather than a set of individuals who study together. In "Early 21st Century Romanticism," it's the entire study group that he texts to declare his love... together. Just something to ponder or mull over. It seems that Troy and Abed aren't making headway with their investigation. The biology lab was locked, Todd points out, and he had to take a picture from outside of the door of his project. This leads the group to discover that Magnitude had a key to the lab the night that the study group's yam was destroyed. Magnitude assures them that his backpack was stolen, with the key inside of it. This leads Troy and Abed to the discovery that Starburns stole the backpack with the key to the classroom in it. And I love that this week, like last, we are returning to a solid Troy and Abed friendship. However... it could be me, but I still sense some disturbances in the force. Two caught my attention. At the beginning of the episode, Abed notes that only one of them can do the zinger, and Troy concedes this to his friend. When the pair do the "Why do they always run?" gag, Troy concedes to Abed again. Again: just throwing out things to ponder and mull over! Starburns is interrogated by Troy and Abed, but won't admit to squishing their science project. So the pair approach Jeff and Annie (who act as lawyers throughout the episode). And there's this theme throughout the remainder of the episode with Jeff and Annie and ethics. Or, what Jeff likes to call, "softness." Remember that Jeff once actually WAS a lawyer. And from what we gather, he wasn't ethical and he wasn't the type of person who cared if he was or not. But Annie isn't like Jeff and he's shown before that he doesn't want her to become that way. Here's the thing, though: we, the audience, are about to learn that Jeff actually IS a good guy and not the same person he was when he arrived at Greendale. By caring more about Annie forgoing her ethics to win, he proves that he's not the same hotshot ex-lawyer who stepped into Greendale, demanding that Duncan help him cheat his way through college. He's evolved. And the problem is that Jeff is so hard on himself for his mistakes. He spends time trying to make sure other people don't end up like him, but he needs to stop defining himself by who he WAS and who he actually has become, thanks to Greendale and six lovable misfits. Jeff, slipping into old habits, instructs Troy and Abed to "get justice" by finding out some dirt on Starburns, rather than building up a case. Starburns explains to Troy and Abed why he was in the lab - he was stealing beakers - and makes them promise not to give up his alibi. Instead, he mentions, he noticed that someone else was in there. He heard a smashing sound and noticed that the culprit had cut his hand on glass -- Todd, he insists, is the one who likely did it. Annie and Jeff are about to convict Todd in front of Professor Kane until Todd's military uncle steps in and takes a hold of the situation. He, as it turns out, is an actual attorney and accuses the group of harassing his nephew. The entire case gets brought to Dean Pelton. And, furthering my theory that Jeff really is harder on himself than he needs to be is the fact that he never gave up Starburns alibi to the dean. This is Starburns, a character who Jeff has never clearly liked nor cared about in the least bit. Jeff has learned integrity, though, and Greendale has taught him that loyalty and trust are more important than winning. He's going to have to remember that, because he'll teach it to Annie later on. Professor Kane sticks up for the study group and for his students in front of Todd, his uncle, the dean, and Jeff. We see, now, a teacher who genuinely cares in this episode and is only hard on his students because he wants them to reach their full potential. Sure, he may have conversations at Greendale that don't make any sense. And yes, absurd things happen. But he has taken the knowledge he has learned outside of Greendale and hasn't let it embitter him or cause him to become jaded (like our group). He didn't run to Greendale to escape the outside world -- he came to prepare those within it FOR the world outside. He's a just and fair and fantastic teacher. As soon as Annie uses her Disney eyes and a line with "the American citizen," you can see Jeff's face begin to get contemplative and uncomfortable -- Annie is a fast learner and very good at what she does. But it's giving Jeff an outside glimpse into who he used to be, and he can't watch Annie win something at the cost of sacrificing her integrity and goodness. He's already tainted and tarnished, but he wants to do all he can to protect her from that (callback to "A Fistful of Paintballs"). So, when Annie intimidates Todd and gets a confession out of him on the "stand," she celebrates. But Jeff requests a sidebar. Inside of Kane's office, Jeff explains to Annie that they should just all take a C+ for the project, rather than fail Todd just so they can feel better about themselves. He tells her: "A man's got to have a code." And I love that Kane perks up at this because he makes it very clear that Jeff is not his favorite person. But I think that this is the moment Kane starts to respect him -- clearly Jeff paid attention when the professor made that comment in the dean's office. But, more than that, the words had an actual impact on Jeff and his conscience. And it caused him to do something that he could have just as easily chosen not to do. That's why I love Jeff -- because he doesn't realize how good he actually is. He keeps thinking of himself as that guy we met in the pilot episode, but he's not. And Annie recognizes these words for what they are. It takes her a while, but usually when her actions impact Jeff, she comes to the realization that she was wrong and owns up to it. He reminds her of her morals and values. Back in the "courtroom," Jeff stares at the yams, wheels in his head clearly turning, before he makes closing remarks. And I love the fact that "Jeff Winger never learns"... is not true. Because he's learned enough in Biology class to know that something is wrong with the yams. As it turns out, all of the projects, when dropped, smash easily. Except for one: Vicki's. It turns out that Neil wanted Vicki's project to do well, so he placed boiling water into the other projects, causing everyone's yams to be compromised. And then, as Dean Pelton, Annie, Jeff, and Professor Kane are celebrating with scotch in the dean's office, the room is hit with dramatic news -- Starburns was rear-ended, and a meth lab in the trunk of his car exploded. He died. We don't get very many serious moments, but this was one and I think it left many people in the state that Jeff and Annie were -- looking at one another, merely thinking "what happens now?" - "If it's any consolation, she got me here on a very misleading text message." "Jeff, technically you are about to be screwed in the Biology room because our final project has been destroyed." - How did I miss Abed's Inspector Spacetime pin? I need that in my life now. - "I fell asleep in a sunbeam." "Likely story." "Actually, it is. I used to live with him. It's kind of adorable." - Britta Perry may have only been in one scene, but she STOLE it: "And as you can see, with a few adjustments, I can make the entire image... Old West color!" - I love when Community foreshadows things. Last week, in the images of "things Abed doesn't know" (among tipping at restaurants and tying shoes), there was an image of a clock. This week, it was revealed that Abed can't tell time. - "Objection: that's not a real objection." "Objection: I hate the both of you." - "We're all fully grown adults failing a Kindergarten project." "Can I object?" "I'll allow it." "Sustained." - "Holy crap! We are definitely dissecting pine cones next year!" - The tag had me in stitches.